Zion Market Research has published a new report titled "Veterinary Ultrasound Scanners Market by Scanning Technology (Analog Imaging Technology, Digital Imaging Technology, and Contrast Imaging Technology), by Product Type (Portable Ultrasound Scanners and Cart-Based Ultrasound Scanners), and by End-User (Veterinary Hospitals, Animal Breeding Farms, and Veterinary Clinics): Global Industry Perspective, Comprehensive Analysis, and Forecast, 2017–2024". 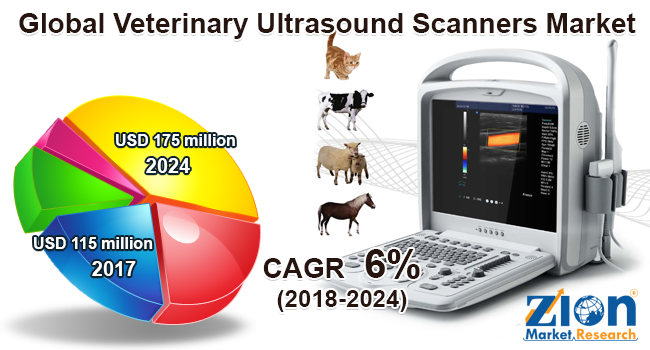 According to the report, the global veterinary ultrasound scanner market was valued at approximately USD 115 million in 2017 and is expected to generate revenue of around USD 175million by the end of 2024, growing at a CAGR of around 6% between 2018 and 2024. The veterinary ultrasound scanners are designed for several veterinary examination applications including distal limb scans, pregnancy scan, abdominal, musculoskeletal, and cardiac scans of animals. These scanners are imaging devices, which obtain images from the inside of the animal bodies using high-frequency ultrasound waves. The veterinary ultrasound scanners help in identifying the problems in the muscles, tendons, soft tissues, blood vessels, and joints. There are various kinds of veterinary ultrasound scanners available in the market based on different technologies and applications. The major growth driver of the global veterinary ultrasound scanners market is the emergence of cost-effective technologies for veterinary and laboratory automation for screening various diseases. Additionally, continuous developments made related to technology and innovative equipment coupled with continued growth in the animal products market are set to fuel the progress of the global veterinary ultrasound scanners market in the upcoming years. However, the threat of substitution by new technologies, such as thermoacoustic computed tomography (TCT), might pose a challenge for the veterinary ultrasound scanners market growth. Nevertheless, the increasing need for accurate and early disease diagnosis in animals, owing to increasing incidences of diseases and severity in animal breeding farms across the globe is estimated to act as another growth factor for the veterinary ultrasound scanners market in the near future. The veterinary ultrasound scanners market can be classified based on product type, scanning technology, and end-user. By product type, the market is bifurcated into portable and cart-based.In the forthcoming years, the portable ultrasound scanners segment is likely to lead the global market for veterinary ultrasound scanners owing to its increasing demand by different veterinary verticals, such as veterinary clinics, veterinary hospitals, and animal breeding farms. By imaging technology, this market is divided into digital, contrast, and analog. The digital imaging technology segment is likely to dominate the market due to the overall advantages in the clarity and easy access of the photographs that can be transferred easily. By end-user, this market is classified as veterinary clinics, animal breeding farms, and veterinary hospitals. North America, Latin America, AsiaPacific, Europe, and the Middle East and Africa are the key regional segments of the global veterinary ultrasound scanners market. Countries, such as Germany, UK, and the U.S., show a high acceptance toward veterinary ultrasound scanners devices owing to developments made regarding animal diagnostic practices and growing expenditure related to pet care. The increasing livestock population, awareness of animal health, and enhanced veterinary facilities are few other factors propelling the demand for veterinary ultrasound scanners in India, Brazil, Russia, and China. Some key players operating in the veterinary ultrasound scanners market are EsaoteSpA, Samsung Medison Co. Ltd., Siemens Healthineers, Shenzhen Mindray Bio-Medical Electronics Co. Ltd., BCF Technology Ltd., Sonostar Technologies Co. Limited, and DRAMINSKI S. A., among others.